Welcome to the haunted hovels section of haunted places in California. Please select a link below to view information on that location. Please note that this section has new locations added frequently, so please check back if you don't find what your looking for. Alternatively, if you know of a haunted location that isn't in the list, then feel free to send me a message in the contact section and I'll will make it a priority to cover it for you. But for now, please enjoy what information has been provided. Native Americans have lived in the area which is now California for 13,000 to 15,000 years. Numerous tribes and bands inhabited the area. Estimates of the Native American population during the pre-European period range from 100,000 to 700,000. The ownership of California has changed many times, including the Native American period, The European exploration from 1542 to 1769, The Spanish colonial period, from 1769 to 1821, and the Mexican period, 1821 to 1848. The final and present owner is the nation of the USA, which continues to the present day. Unexplainable noises have been reported, and people have sighted a female ghost walking around backstage area. There are many ghosts said to be aboard the vessel reported many times by staff members. Ghosts of sailors who perished on board are well documented. Reports of paranormal activity include very cold spots near the fireplaces, library, kitchen and pantry. Also the sound of someone walking across the butler's pantry floor, to the formal dining room is often reported. It is said that it is haunted by the original caretaker. In the room where the children lived it is said you can feel a strange presence. Said to be haunted by Sarah Norton, also known as the "White Witch". She was a midwife and died nearby from an accident were her carriage rolled over and she was crushed to death. She is seen in the graveyard floating around the tombstones. In May 1976 on a memorial night Rocks of all sizes started lifting off the ground and hitting places, people, and breaking windows to cars and houses. No-one was able to explain it. It was happening on and off for three months. It was investigated by Duke University and was written up in the LA Times. There was no explanation given to the people who were attacked by this strange occurrence. It seems it was merely Covered up and forgotten. The original proprietor of the building is known to haunt the pub and often cause's it to be known. Employees report moving furniture, dishes and other various objects during their shifts and the ghost is well known to established patrons. Haunted by several ghosts who were residents during the borax mining. The hotel workers have pictures of orbs and many stories as well as some documentaries have been filmed on the hauntings here. It is said that a young girl called Alice haunts the old children's nursery in the Inn. Some say she died of allergies to bee stings, because when they tore down a wall in one of the bedrooms there was a bee hive covering the whole wall. One eyewitness and Neighbor to the Inn for the last 20 years said she saw birds vortexing into the chimney. They say Alice is friendly and loved cats, they often find cats rest in the windowsill of the Nursery. Reports of apparitions of a young couple, they look to be around 18 years old. The area has a strange chill to it, and a feeling of being watched. Apparitions of the couple are most often seen at the top of the bleachers. The House built in 1911 has had numerous experiences. Three spirits are said to be in residence. One young man who is seen hammering is believed to be a man who fell to his death when the building was being built. The second is an elderly woman who stands and watches people. The third is a man always described as "angry". He is believed to be one of the former owners. Lights switch on and off, doors and windows open or close by themselves. Doorknobs rattle, voices can be heard, and the sounds of footsteps on the staircase occur often. Haunted by the former owner who died of a heart attack behind the bar in 1967. He likes to knock things off walls, stack the coins inside the cash register and open and close doors. During the 1800's, a young woman hanged herself in one of the rooms of this hotel. To this day, people report seeing her apparition in the window that faces the street. Other guests claim to see lights going on and off and someone talking or crying when no one is around. According to the previous owners, there were at least two other ghosts who haunted the place as well. In the beautiful entry way was often seen a ghost who was thought to be Douglas Fairbanks. This previous monastery is now a college. It is thought Mother Cabrini now haunts the campus. She was once one of the nuns that resided here. Her face is even sculpted into one of the buildings. The bell in the bell tower has been known to ring late in the night all by itself. Employees have heard noises of what sounds like a man laughing, shadows moving up and down the isle late at night are also commonly experienced. A specter dubbed the "White Lady" has been seen here as well as the smell of tobacco and fish from the spirit of a fisherman. Rumors of Natalie Wood's ghost have also been talked about in the area where she drowned. said to have a ghost that appears as a glowing mass in last room on the left. Main kitchen has several ghosts and there are photos on display of this. There are several ghosts that haunt this old school house, several people have heard children's voices when no one is around and others have seen a white mist walking around. Doors fly open by themselves. Also there is always a feeling of being watched. Faculty has reported strange smells and being touched when no one else is in the room in the early morning. Night cleaning crews have told of flashlight beams being restricted to only a few feet in front of them in seemingly clear hallways. Room number 1 is supposedly haunted by one of the former boarders from when the Inn was a boarding house. Reports of the water turning off and on by its self. Others have reported someone getting into bed with them, or laying on top of them, only to find no one there. The door at the reception desk keeps unlocking it self when a button behind the front desk is needed to unlock it. The door also appears to have someone push against it trying to get in even when no body is there. Old abandoned hospital across from Hollenbeck park on Chicago St. People who go there have reported seeing lights and hearing a little girl laughing and playing around in there. Screams, cold spots, noises, cries, moaning, lights coming on and off are all common. Witnesses have reported that the High School's gym is haunted. Many times after school, a basketball being bounced as if someone was playing, and accompanied by the sounds of fans cheering. No one really knows the origin of this phenomena. Large, heavy objects moved across the floor overnight. Sightings of a former post commander who died of malaria in 1859 looking out window of the old hospital building. Sounds of construction work at the school. Rumor is that a construction worker died when it was built. Has a chair that has had eerie happenings surrounding it. The lady that owns the inn has said that people had died mysteriously not long after they had sat in the chair. Formerly the Redwood Hospital - is said to be haunted by a lady. she is often seen roaming around in the garden areas and there has been the sighting of a man who apparently appears in one of the windows. Noises in the dead of night, heavy footsteps and apparitions experienced here. The former owner's daughter claimed she would see figures wearing Victorian style clothing. The basement is said to be haunted By A Nun, her apparition has been witnessed numerous times by visitors. This modest home has been the seen of terrifying poltergeist activity since the mid 80's and has continued to this day. This house has had over 22 different occupants since the phenomenon started. Some have reported seeing red eyes peer out through closets and darkened bedrooms as well as objects flying off counter tops. On the southeast corner of Harbor and Commonwealth where the old Melody Inn was destroyed by fire in the 80’s an image of the former owner’s father appears with a box of matches. The ghost of Mr. Melody has actually been known to provide a light of a smoke to customers outside the new businesses and then smiles and vanishes. Rumor has it that the ghost of a girl named Lizzy haunts the Heritage Hall. It was reported that in 1933 while Lizzy was leaving the building, the Long Beach earthquake took place and pieces of the building fell on top of her. Lizzy was crushed and died instantly. Janitors and teachers of the school reported hearing voices, doors slamming, even apparition of a girl in a dress while working there at night. In the the late 1800's, A woman who lost her lover is said to of committed suicide and jumped from the upstairs balcony. She is still reported to be seen in the upstairs rooms. It belongs to the Daughters of the American Revolution and after having purchased the residence in 1982 at their first monthly tea, they all reported having seen the apparition of a lady whom was a former resident, in the early 1910s'. The downstairs reception hall is said to be haunted by spirits that drag chairs across the floor, turn lights on and off and voices are heard when no one is down there. The hotel was built in the 1800's and has hosted presidents, actors and was at one time a brothel. Arletta Douglas supposedly haunts the dining room named after her. Many of the hotel rooms are haunted by former guests who made the hotel a second home. The building was converted into a Christian boarding school in the 1960's. It was shut down in the mid 80's. Doors opened and closed by themselves, drastic temperature changes, pictures flying off walls and windows opening and shutting on there own are common experiences here. The Irwin Street Inn is home to at least 3 ghosts. There are occasional slamming of windows, moving of bed sheets, switching on and off lights. Ghosts are often seen in the dining area and on the second floor. Faces have been seen in the bushes and strange noises heard inside the graveyard. Things have been moved from headstones to unexplainable places. Also whispering and thumps heard when walking through the main part of the cemetery. Strange movements and dark shadows in the distance are also common. This Victorian era hotel is the home of a ghost that lives in one of the ground floor rooms. The spirit does no harm and its history is unknown. Noises such as stomping and banging are heard especially at night. The resident ghost of the theatre, Christine, has left messages on the walls and on the roof. She has also been seen onstage and in the backstage areas. Usually she is personified as a white blurry figure that people see wandering around. Famous hotel from the 20's that has been home to every legend from Howard Hughes, Marilyn Monroe, Boris Karloff, Jim Morrison and of course is famous for site of John Belushi's death. Many kinds of phenomena have been witnessed here. There have been sightings of two ghosts who walk near the piano after closing. The bar is also haunted by some unknown presence by the large mirror in the wall. A young boy that goes by the name of Toby committed suicide after his girlfriend left him for someone else. Many teachers and students have reported hearing doors open and close by themselves, loud hammering, objects moved from one place to another, a shadow roaming around the auditorium (where he hung himself from) and unexplained sounds coming from the second floor. A stop at the Hollywood Roosevelt Hotel is a must, as at least two famous, and several not so famous ghosts reside there. The hotel's most famous haunting concerns a mirror which sits outside the elevators on the hotel's lower level. The mirror originally was part of the furnishings in a room which was frequently used by Marilyn Monroe. Several people have reported seeing the actress image reflected in the glass of this particular mirror. An apparition of a boy about 11 to 13 years old dressed in all white has been seen around a bomb shelter, and when spotted he will run around a corner and disappear. it use to be the home of an elderly couple who also died in here many years ago. A lot of people have herd footsteps, strange moans and sounds, things fall and lights turn on and off when no one is in the room. 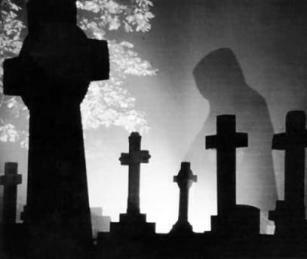 Sightings of supernatural beings and noises heard throughout the large cemetery. Employees have seen strange and somewhat supernatural occurrences. One such incident occurred when an employee tried to approach a woman who seemed lost but disappeared before he could approach her. A very talented drama student died suddenly back in the 1970's. To this day, people working in the theatre at night say that the friendly spirit often sits in the center of the house and can sometimes be seen as a green faintly glowing region of the seating. The Willow Hotel reportedly has been haunted since the 1800s. Under the Hotel an old gold mine caved in and killed 23 miners, and now the hotel is haunted by them. There's a ghost in the mortuary that they refer to as the white lady, She has been seen many times, there's also been sightings of a white light, there's been many times when the PA system was off, and you could still hear choir music. This 80 year-old golf club has many elderly members and a lot of these members passed away while at the club. Strange occurrences at the club include noises, lights that come on by themselves, and especially, there are dark shadows that move in the corridors and on the golf course. Guests complain about a little girl calling for her mommy and jumping on the beds. Apparitions, Pictures falling of the walls, vending machines dispense soda on their own, cold spots and doors slamming on there own are common here. Employees have felt uneasy around the bottom floor rooms. EVP has been recorded and Photos have been taken around the hotel. Periodically there are reports that a young woman has been seen floating below the surface of the lake. She is dressed in fine clothing from the late 1800s. Its the oldest building in the city, and is so haunted that its said if employees talk about the ghosts to anyone, they will be fired. At random times, you can hear footsteps on the wooden floors on both levels, music from an old scratchy record and the smell of vanilla and old flowers in certain areas. A young man is said to have committed suicide by jumping off the Mossdale bridge into the San Joaquin river below in the 1970's. His ghost has been seen on the bridge at dusk wearing blue jeans and a red checkered Flannel. It is said the theater is haunted by two ghosts. One is an old man who died from a heart attack, he is said to be sitting in the last row, his seat always stays cold. The other is a boy about 16 or 17 who fell from the balcony when working spotlights for a play. People have said that they can hear his screams. The story goes that one night in 1789, a groundskeeper for the tuberculosis hospital went crazy and shot all the children. It is said their screams can be heard constantly. The large chapel definitely has two separate presences. One is of a priest, the other chapel presence is a young girl. She was more than likely baptized at and lived at the mission. Her presence is strongest in the back by the baptismal font. It is one of happiness and a youthful playfulness, she was possibly quite young. Supposedly built on an Indian burial site. There have been voices and strange occurrences here. Including hearing a faint voice in one of the apartment closets of a man, two men stealing goods from the pantry, and scratches on resident's faces in the middle of the night. The college was built on the site of an old Navy hospital that existed during WWII. The hospital took in all the soldiers that were wounded in the Pacific. The hospital was torn down and the dorms for Cal State Long Beach were built. Many students report seeing men in Navy garb. A man in a Doctor's coat is also reported. An apparition of a girl has been seen twice by employees working the graveyard shift. Some nights after closing, music and laughter has been heard. When workers go to check it out the music and voices stop. The camp used to be an old tuberculosis Hospital and an Indian residence before it was made into a girl scout camp. It is said that at night you can hear and see the ghost of a nurse pushing her cart down the hallways and patients who died there moaning. It is also been said that Indian spirits have made appearances. Reports of a headless skater appearing. The skater is said to have tried a trick and fallen on his head and he broke his neck. Joggers have claimed to see the figure of an Indian man when running near this creek. Some say that the spirit of the Indian is watching over the joggers who run the trail. Others believe he is protecting the sacred land. There is also the spirit of a young man who haunts the bridge on Clause Road. It was reported that he jumped off the bridge into the shallow creek and died. Joggers have reported that while they are running in the early morning or late at night, they can hear a shallow yell or scream along with a splash. The spirit of a young man paces the balcony of the Modesto High Auditorium. There are also reports of knocking noises heard in the main hallway that are coming from the tunnels that used to run under the school. There are several building on the old Naval Base that are reported to be haunted. One is the old infirmary, which was built in the 1930's. When the base was still operated by the Navy, Security Police Officers would check the building at night and reported seeing a little girl dressed in old style clothing inside staring at them. An apartment on the first floor of the M building is haunted by the spirit of a woman. Muffled voices are heard, phantom music emanating from the kitchen, lights turned on and off, cabinet doors opened, and she has appeared as a full apparition. Apparently there was a death in the apartment that could contribute to this, but the woman's apparel seems to be from a time predating the apartment complex's construction. Witnesses have heard loud footsteps and opening and closing of doors when the halls are empty. The girls gym room is haunted and students have heard lockers open and close when no one is present. There have been door knobs that turned when no one was in the hall, shadows passing under the doors, footsteps heard, faucets turned on in some apartments, heavy perfume smells and chains rattling. Some apartments are said to be more haunted than others. In room 9, reports of an apparition of a boy doing school work, believed to be a boy that died in a horrible car accident nearby. The Bard Mansion, which resides inside the Port Hueneme Navy Base was originally built in 1876 on Senator Thomas Bard's Estate named Berylwood. In 1911, the enlarged second home was torn down to clear the site for the construction of the present Thomas Bard House. It's rumored by many that the mansion is haunted by the late Senator's wife, Mrs. Bard. Her figure can often be seen walking the grounds, perhaps making sure everything is in order. The sycamore inn, now a great steak house along the old route 66, was established in 1848 but the original inn burned down and was rebuilt across the street. Apparitions of a man dressed in cowboy style clothes has been witnessed here. It is located off the main highway used by truckers. Legend states that a woman was murdered in one of the bathtubs and Howls and footsteps can be heard when no one is around. The Fox Theatre is supposed to be very haunted and the presence that resides there is sometimes violent. The building it's connected to was once an opera house when Redlands was first founded. Maybe one of the jealous actresses is still wandering? Hillside Cemetery is a very old cemetery with interments dating back to the mid-late 1800's. Many people have reported strange happenings such as car horns honking by themselves and balls being thrown back over the walls when no one is there. a large house with 100 stairs `outside and 900 stairs inside. it is said nuns haunt the residence and it once was a convent. People live there today but unlucky for them, they're not the only ones. An older man and a young pregnant woman in 1920s clothing wanders the office area and pool deck. They have been known to walk straight across the pool (right above the water) and fling papers and chairs around in the office area. Many of the lifeguards and faculty refuse to be there alone after dark. The haunting is focused on Alice Miller's room on 4th floor in the south east corner. This two-level room is very active. Reports of cold spots, touching, apparitions and a strong presence of Alice. People have said to have seen many "Black Blurs" wondering the area, and have heard screeching cries that sound like children being tortured. One of the faculty members died in a car accident right in front of the school. Since then, at night students have been reporting a lady wearing torn up clothes and scars through her face standing in the middle of the road. Reported to be one of the most haunted buildings in Sacramento, this theater is home to at least five ghosts. The most well known specter, believed to be a former stagehand, has been affectionately dubbed "Pinky" because of the glowing pink aura that is often seen near hot spots. Disturbances include footsteps heard on the stage after hours, a man walking the hallways and lights flickering. An old woman is said to have committed suicide by hanging herself in the living room. She has been seen wearing a black dress. Children and other witnesses have reported of a feeling of choking, and a feeling of her trying to interact with them. In the boys locker room, showers sometimes turn off and on by themselves. The boy's bathroom in the gym's front room has been reported to have loud whispering coming from it when no one is inside, and a malevolent force is often felt there. In the gym, cold spots are often felt on the bleachers, and at times people have felt a hand grab their ankle or shoulder, even if alone. Students in the band room have reported instruments in cases being ejected out of lockers (locked with combination locks) And their cases being flung open during private tutoring sessions. A 911 Operator got a call from Room 1007 in this hotel. When police investigated and found the room empty, the manager thought the call might have come from the ghost that haunts the room. The spirit is believed to be a deceased night clerk who died when the former hotel on the site burned down on December 19, 1940. The current hotel was built with bricks from that hotel. Several of the hotel employees report getting calls from Room 1007 at the front desk, but when they investigate, the room is always empty. It is a house that was owned by Sarah Winchester. It is believed to be haunted by Sarah and the spirits of those who were killed by Winchester's guns. Cold spots felt, an impression of someone lying in Sarah's bed, apparitions, rocking chairs rocking, being pushed by unseen hands, disembodied talking and laughing has been reported here. It has been said that a woman, 2 men and 2 children haunt the chapel of the mission. Apparently they went there to hide from men who were drunk and attempting to rob and murder them. Unfortunately they did not get away, and were indeed murdered. They have been said to relive the incident often. Sightings of a little girl wandering around the store. According to employees they have heard her giggling at night when the store is closed and some have the feeling of being watched and touched. Apparently in the early 70's a body of a little girl was found in the back of the store. Built around 1918 after the original structure was destroyed in 1912. Workers have witnessed apparitions, strange laughter, screaming, cold spots and freezer doors flying open violently along with the ejection of the contents. In the mid 80's a car load of kids going to prom wrecked their car at the intersection of Sand Canyon Road & Warm Springs Road. Reports of a young woman signaling for help, and then vanishing. The phenomenon occurring at the WPNS Station covers a variety of ghostly manifestations such as apparitions, knocking, footsteps, horrible ghostly moaning, laughter, animal spirits and even poltergeist antics. People have claimed you can sometimes hear the screams of miners coming from the abandoned well. There have also been eye witness accounts of an eccentric looking lady, wearing black, roaming the inn grounds. This hospital for the mentally disabled once was an insane asylum which had mistreated many patients. Today the main building of the State Hospital by night has the foreboding presence of this torture. Sounds of screams are heard through the night, And large looming shadows of people walking outside can be seen when no one is about. In 1968 a young man died in the Hahn auditorium. Student's have heard footsteps and have felt cold spots through out the school. The Rialto Theater is over 70 years old and supposedly many people have died there. In the bathroom a girl slit her wrists and climbed up to the balcony and bled to death in the seats. It is also said that a man went crazy in the projector booth. The doors to the stalls in the girl's bathroom shake and an apparition of an older man has been seen sitting in the seats. The older man has also been seen walking up and down the balcony stairs. Will Rogers made his last performance at the California Theatre, he died in a plane crash a few days later. It is said that he haunts a practice room in the theatre. It is continually cold in this room and he has been seen looking out the room's small window. At night in the underground area where the holding cells are shouting can be heard when the place is empty. The night guards also report hearing the holding cell door on the second floor slamming closed, also when no one is there. There have been many reports of one of the rooms in this hotel being haunted by a man. He apparently died there of a heart attack. Guests will often complain of noises coming from the unoccupied, haunted room. Apparitions of the man have also been seen. The inn is haunted by a former California senator and his wife. The Senator is heard pacing upstairs in the main house and his wife is sometimes seen in the hallway. A black spirit has been seen in the embalming room of this funeral home. Many other strange experiences have occurred such as lights turning on and off, knockings at doors and ghostly whispering. Sightings of old nuns lurking around the third building hallway have been reported. Witnesses have also seen an old drama teacher in the drama lab and visions of blood in the hall ceiling. There have been sightings of children running through the hills around the reservoir screaming. Rumor has it that in 1962 an alcoholic father took his 3 sons and 2 daughters on a fishing trip and went insane and hunted his kids down one by one. The ghost of a world war 2 sailor has been seen by witnesses going down a ladder into the engine room. He then walks to a cubbyhole where there is only a desk and chair, and disappears. Bard Hospital has been turned into an office building. Now things move around by themselves and lights go out without human help. Apparently, If someone wants them to go back on, all they have to do is say, "I'm not finished yet!" and they'll go back on. This restaurant, once a private Victorian home, is residence to a ghost of a young girl who killed herself after she had an affair with a salesman and got pregnant. Now it is said that you can see her apparition looking out the window waiting for her lover to return for her. This house is located in the middle of a strawberry field right off the freeway. It is fully boarded up, but there are very noticeable hot spots on the roof of the house that shine blue, as well as many orbs that surround the house. From what the people that own it say, many people were murdered in this house, and it is extremely haunted. Doors slam and open on their own. Screams of a little boy are heard as well as adults yelling for help. Many guests at this old motel have felt uneasy while staying there. During the night loud noises can be heard coming from rooms that are vacant. Even on a few occasions guests have been awaken by a knock at the door yet no one is there, and the knocking persists throughout the night. A few of the rooms here back into a field which is said to be an old graveyard. Some of the rooms have bathroom windows that look out onto the field and many guests report glowing red eyes looking at them through the window. In the middle of the Stadium there have been reports of a man or teen running laps, when people go to confront him he disappears right in front of them. An apparition of a blond blue-eyed man has been seen by maintenance staff and visitors. The ghost was a victim of cholera and was a patient there during the Civil War. The young man appears to be confused and wanders aimlessly before vanishing. Its said to be haunted by the ghost of a fireman killed when the original opera house burned down. The area of the basement where a wall fell on him and killed him is the site of the haunting. some people also report someone up in the balcony and they smell cigar smoke. The ghosts of students who died in a bus crash in the 70s have often been seen on the stage. Opening night of the musical fiddler on the roof was disrupted by the lights not working. Apparitions have been seen by the light cage and the costume closets. Cold spots are always felt in the tool room.